Human TNF-alpha, His Tag (TNA-H5228) is expressed from human 293 cells (HEK293). It contains AA Val 77 - Leu 233 (Accession # NP_000585.2). The protein has a calculated MW of 18.2 kDa. The protein migrates as 18.2 kDa under reducing (R) condition (SDS-PAGE). Human TNF-alpha, His Tag on SDS-PAGE under reducing (R) condition. The gel was stained overnight with Coomassie Blue. The purity of the protein is greater than 95%. Immobilized Human TNF-alpha, His Tag (Cat. No. 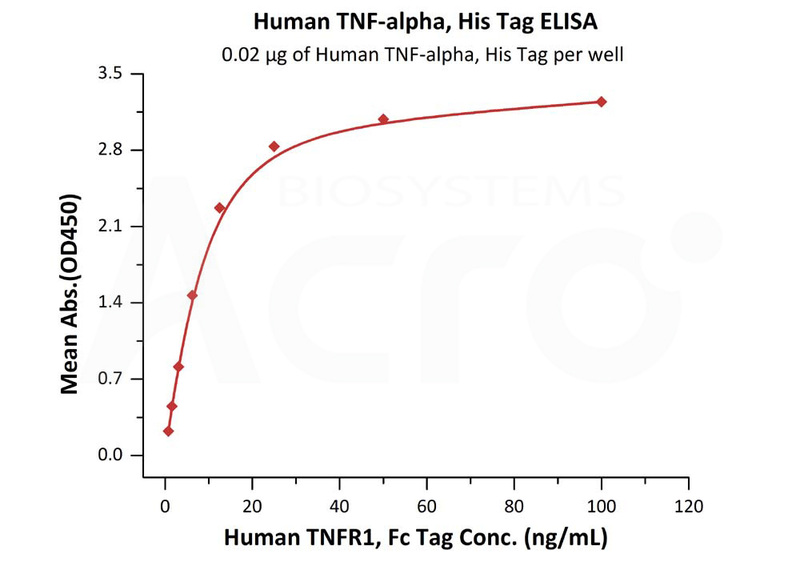 TNA-H5228) at 0.2 μg/mL (100 μl/well) can bind Human TNFR1, Fc Tag (Cat. No. TN1-H5251) with a linear range of 0.4-6.25 ng/mL (QC tested). Humira (Adalimumab) captured on CM5 chip via anti-human IgG Fc antibodies surface, can bind Human TNF-alpha, His Tag (Cat. No. 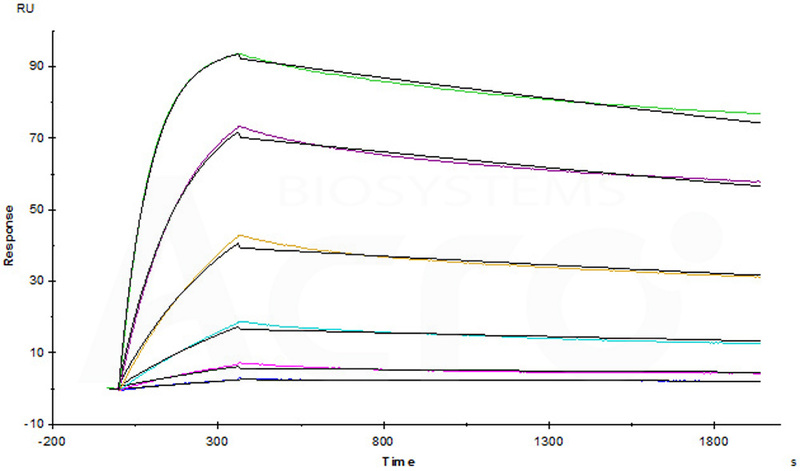 TNA-H5228) with an affinity constant of 0.244 nM as determined in a SPR assay (Biacore T200) (Routinely tested). Human TNF-alpha, His Tag (Cat. No. TNA-H5228) induces cytotoxicity effect on the WEH1-13VAR cells in the presence of the metabolic inhibitor actinomycin D. The EC50 for this effect is 0.013-0.074 ng/ml (Routinely tested). 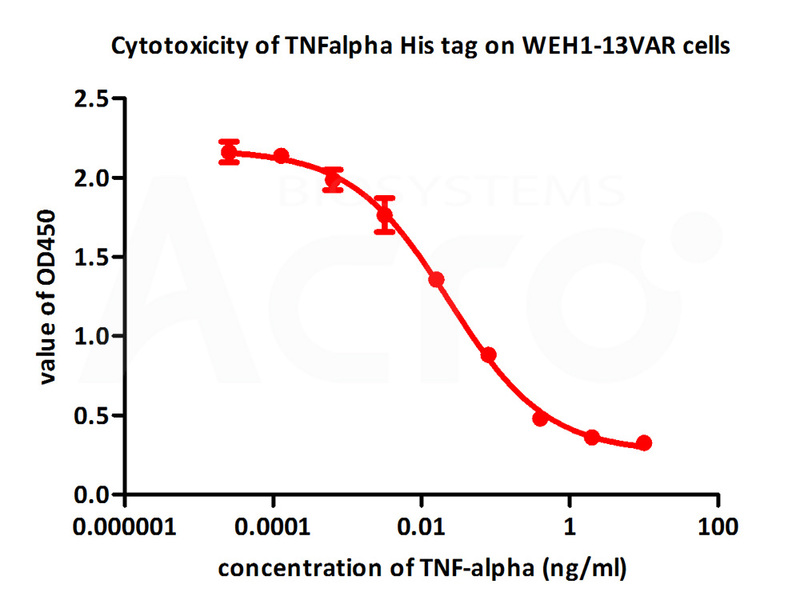 Neutralization assay shows that the cytotoxicity effect of Human TNF-alpha, His Tag (Cat. No. 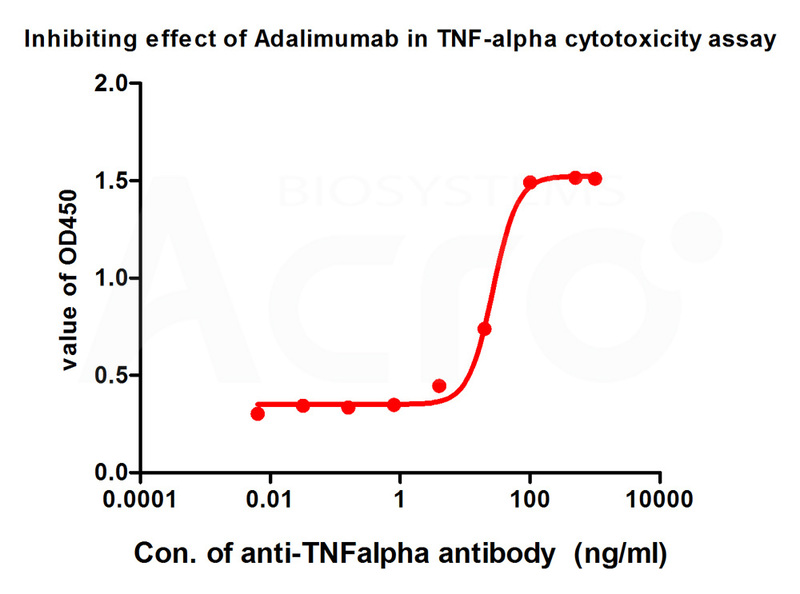 TNA-H5228) was inhibited by increasing concentration of Adalimumab. The concentration of TNF-alpha used is 1 ng/mL. The IC50 is 26.8 ng/mL (Routinely tested). Tumor necrosis factor alpha (TNFα) is a cytokine produced primarily by monocytes and macrophages. It is found in synovial cells and macrophages in the tissues.The primary role of TNFα is in the regulation of immune cells. TNFα is able to induce apoptotic cell death, to induce inflammation, and to inhibit tumorigenesis and viral replication. Dysregulation of TNFα production has been implicated in a variety of human diseases, including major depression, Alzheimer's disease and cancer. Recombinant TNFα is used as an immunostimulant under the INN tasonermin. TNFα can be produced ectopically in the setting of malignancy and parallels parathyroid hormone both in causing secondary hypercalcemia and in the cancers with which excessive production is associated. (1) Dowlati Y, Herrmann N, et al., 2010, Biol Psychiatry 67 (5): 446–457. (2) Swardfager W, Lanctot K, et al., 2010, Biol Psychiatry 68 (10): 930–941. (3) Locksley RM, Killeen N et al., 2001, Cell 104 (4): 487–501.